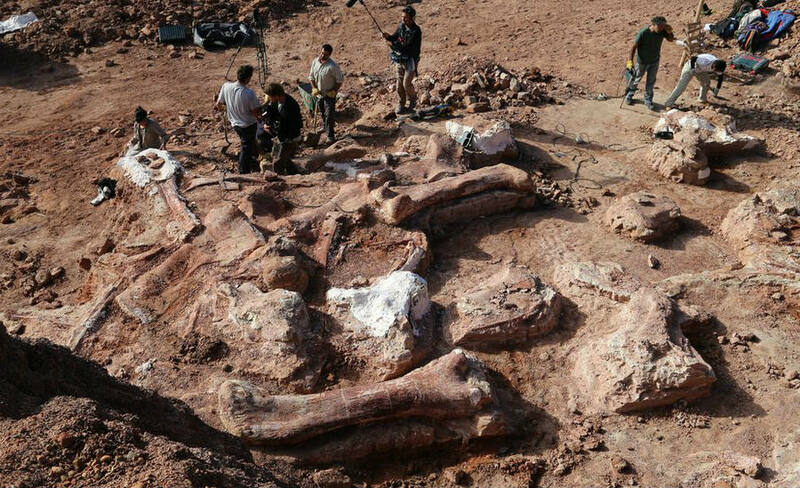 Argentina – On Thursday, scientists discovered a baby Rapetosaurus krausei fossil that shows that these Titanosaurs hatched with adult-like proportions. This means that they didn’t need parental support and were actively foraging for plants rather than waiting for their mom to feed them. The fossil that dates from 66 to 70 million years ago was discovered in Madagascar, where scientist found that a tiny titanosaur was about 14 inches (35 cm) long when it died, the reason? Apparently of starvation. Michael D’Emic, who is a paleontologist from the Adelphi University from New York, stated that this is the first evidence for a truly precocial dinosaur where they were one of the largest land dinosaurs, which according to the analysis; they grew really quickly to adult-like proportions almost right after birth. A paleontologist at Macalester College, Kristy Curry Rogers noticed the bones from this Titanosaur that were found unearthed in Madagascar in 1998 and 2003 but, until then were misclassified. After it, Curry also stated that the precocial young can avoid predation on their own, meaning that there is a really small chance of the entire brood succumbing to predation at once. The “little” Rapetosaurus were known from a partial skeleton including limb bones, pelvic bones, fingers, toes and several vertebrae around 4 feet (1.2 meters) long from head to tail and weighed between 50 and 90 pounds (23-40 kg) when it died. But what about an adult one? Well, they were probably around 40 feet (12 meters) long, which is about a little more than a school bus and they weighed around 16 tons, almost as twice and a bit more as an elephant. Another fossilized embryos in a nesting site in Argentina also hinted that another titanosaur species that was precocial too. Precocial means those being self-sufficient right after hatching. “It’s always seemed a bit weird to think of titanosaur having much in the way of parental care,” says paleontologist at the University of Maryland in College Park, Thomas Holtz, where until now, there was no way to tell for sure. The titanosaurs were a diverse group of sauropod dinosaurs, which included the Saltasaurus, the Isisaurus and now the Rapetosaurus. The titanosaurs were the last great group of sauropods, which existed from about 90 to 66 million years ago, before the Cretaceous–Paleogene extinction events, and also they were the dominant herbivores of their time. The fossil evidence suggests they replaced the other sauropods, like the diplodocids and the brachiosaurids, which died out between the late Jurassic and the mid-Cretaceous Periods.